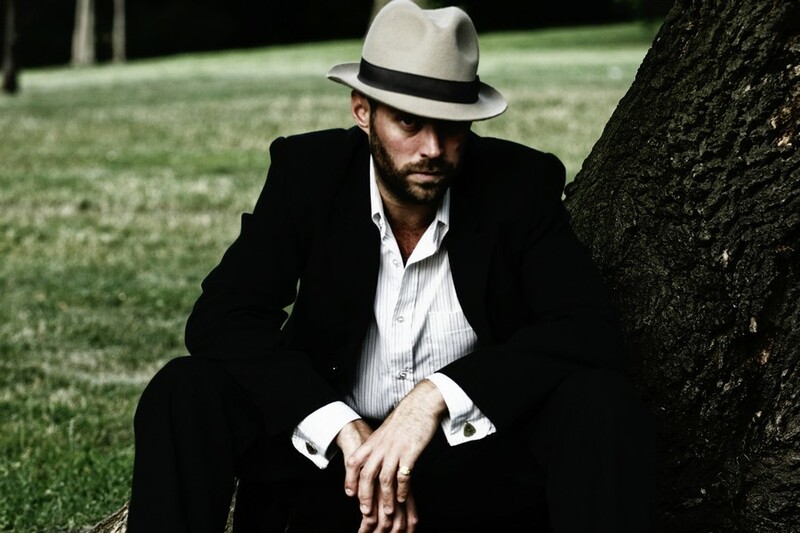 Charismatic English songwriter Alasdair Bouch is based in Prague for almost a decade. The contact with the audience is an essential ingredience for him, you can find yourself in his lyrics. In this interview we talked about his new album Go forth!, his Scottish roots, inspiration, fame and its forms and also about love. To start the interview I'm gonna ask you something you've been asked many times before: what was the reason that you left England and came here? I was planning to move to Germany so I was already travelling around the world a lot at this time and I decided I want to learn how to teach English so I could play and keep travelling and work at the same time.The school that I chose had a number of different locations but the most exciting one I thought would be Prague so I chose Prague. Or Prague chose me. And you've been here for eight years? Yeah, over eight years now. Franz Kafka said that Prague has claws, she doesn't let go and I think it's true. Do you miss England or do you feel like at home here? I definitely feel at home here. I think you make yourself at home at most places, you can acclimatise to most places. I didn't really miss England much but I went back this winter and had a very nice feeling from it this time. My parents live in the countryside so I was very relaxed and we were there for a nice occasion, my sister was getting married and it was just a short visit. So maybe the shorter the visit the more I enjoy it. I miss my family and my friends, that's what I miss and the countryside is beautiful in England. But I don't miss the politics and the awful TV programme Downtown Abbey. And it's nice to walk down the street – although I speak some Czech – it's nice to walk down the street and not understand everybody. I'll probably have to move to a country where I don't understand the language because now I start to understand Czech conversations on the street to so I have to change it. Your name doesn't sound like a typical British. What's the origin? My spelling of Alasdair is a Scottish spelling, there are about 9 different ways to spell it, for example Allister or Allastair but it all comes from the same root, the origin is Alexander. It means "defender of men". So your roots are Scottish? They are, half of them. I'm kind of Scotts-English I suppose with some Irish as well thrown in. No Welsh, unfortunately. Otherwise I've got everything else covered – Scottish, Irish, English but have an interesting mixture in our family. My mother's Scottish and Irish side and my father's the English side. And my surname – Bouch – may sound French but it's not. It's from the border of England and Scotland and it's kind of a new way of spelling the old scotts English. It's funny as you can read many things online and there are many companies where you can trace your roots in Ireland, Scotland,etc. But most of them get it wrong.My father traced it further and further and further back and found where we originally came from, with that name at least. I love Scottish people and I love the culture,the poetry, interesting history. Speaking about music, tell us how it all began. Have you always known you wanna be a songwriter? Did you learn to play the guitar by yourself? Yeah, by watching people, by listening. I've never been classically trained and i even now play the guitar pretty badly if you like, in my own way, i don't play it classically. I just watched people and then go home and tried to recreate that but maybe i put my fingers in a wrong place,etc. But perharps it's a part of my style. And I would encourage anybody who wants to pick up a guitar or any instrument just to do it, don't wait to get lessons. You can learn on the internet nowdays which we obviously didn't have back then either. We couldn't look there and see how to play our favourite songs. I think it helps to be surrounded by musically minded people. It helps to have friends who either play or listen to music. I think it would be hard to struggle on your own. I was lucky in that, all my friends wanted to play guitar and look cool in bands. But back then i was mostly a singer i wasn't learning the guitar to play live. Even with my first band it took a long time before i actually picked up the guitar and played on stage even i wrote all the songs and I played them to the band and then i would give them to the guitarist and he would play them and i would sing. It's when i started to make more complicated songs with two guitar parts that i actually had to play. I suppose that was a new thing for me to start, it was like starting again because i've always sung on stage but then having to play the guitar on stage and sing at the same time it was a new experience for me. It was nerves wrecking actually at the time. What about the inspiration for your songs? Where does it come from? It's such a difficult question,a lot of people ask it and I guess it's a responsibility of the journalist to ask that but at the same time I think it's the curse of every musician to have to answer it. I should come up with a different answer every single time. I get inspired from many different things from day to day, I don't have one artist who inspired me at the beginning and through different periods of my life i did t ever want to sound like another artist. Actually I actively go out my way not to sound like another artist and when I write a song which sounds like my favourite artist I normally throw then in the bin because I don't wanna create something which has already been done. And I can feel it when I'm playing a song, even if I love it and I feel it sounds too much like Dylan or it sounds too much like this or that, Simon and Garfunkel or whoever I'd say no I couldn't play this in front of an audience and say it's my song. That's not what I think of when I think of inspiration. When I think of inspiration I think of people or situations, weather. I was in a bar the other day and a friend was telling me how broken up he was about a girl who split up with him. That inspires me. I think of phrases and what sounds musical to me. If I hear a phrase and I can fit a song around it, that's it. Of course I've had musical influences but I don't sound like them,I don't sound like Frank Zappa, I don't sound like Abba or Duran Duran. I grew up with all these people,listening to these people but it all goes into a melting pot. It goes in and you stir it up and what comes out, well you pull out what you think is interesting. I think the most important thing is to be yourself. Yeah that's absolutely right but at the same time it took me long time to find my voice and the beginning,the songs that i wrote when i was younger of course they were inspired by that kind of music i was listening to but as I got older and as I matured as a songwriter I allowed my voice to come out. I learn to actually let my voice to come out, it's quite a struggle sometimes. You can write and write and write and write and write until the true words come out. And I know when it's my song and not somebody else's song just coming through me, when I feel deeply what I've written, it's like written in my own blood when I actually think nobody else could have written that because it's so me that nobody else could have written it that way. I grew up in England but I studied English literature at university so I learnt about deconstructing texts and poems and how to read between the lines and how all these things are constructed somehow, from the life experiences of the writers themselves. What you read is not just what they've written. You're reading into their life, behind the words is whole lifetime of experiences and they might use this word because it means something very particular to them and that's how I see songwritting. Not because I don't use this word because Leonard Cohen uses it or I use this phrase because it sounded so good in Bob Dylan's song, I use it because it has a special resonance and feeling for me. This a very long answer to a very short question but this actually a very important question that you ask because inspiration isn't just musical even though it shows itself through me in music that's why we say certain women are muses. They might not be musicians themselves but they're muses. When I listen to Bob Dylan or whoever and feel like I have to write a song I stop myself I don't write it because I know I'm channelling something else at the time.I think the best way you can do when you're starting out is playing your favourite band's songs. But if you wanna be a songwriter and you're still playing your favourite band's songs but using your own words and music, it's not quite the same. It's like you wanna be like them. The world doesn't need that. The world needs another songwriter. Songwriting is a craft and that's why we love our favourite songwriters because those songs can only be written by them. It can only be written by Dylan, it can only be written by Leonard Cohen, it can only be written by Jeff Buckley. We find ourselves in them because they make us recognize certain things about life or love. You travel a lot with music. Which places are your favourites? When I was in Africa I heard some great music and I like the culture and the dancing in that continent. It's really hard to stay still when you hear this music. For me music is deeply into woven into tapestry of each country. For example walking through the streets in India and you would hear some devotional music or music from radios or taxi cars, coming from shop windows, it all adds to the flavour,the smells. I remember just standing in the street, literally stopped my tracks in the streets of Maidan near some temple but I couldn't work out where the music was coming from, these speakers were all over the street and it was just coming really loud, this guy just riffing on his pipe, it was like a John Coltrane solo on this Indian pipe and I couldn't figure out where it was coming from and who was making it but i was kind of transfixed by this . Or being in Indonesia and hearing some of the local music there was just beautiful. This was just around the time Buena vista social club came out,the film which I did publicity for long time ago, I was quite atuned to different cultures in music I've always been that way. I was listening to John Peel radio DJ when I was younger he used to play really interesting music from all over the world. I've already known what was out there but this film Buena vista social club built a platform for unknown or not so well known artists or forgotten artists from these cultures where you would think wow, these guys really could stand a chance getting famous. So hearing these guys in Indonesia,a little group playing these beautiful songs was like wow, I wonder what their story is. You don't just listen to them and think yeah,nice music. When I was in Zimbabwe I was sitting in the garden, just playing quietly to myself and this local guy comes up to me with this old tape recorder,he puts it down and says "Man,check this out, you've never heard anything like it" and he pressed play and this voice came out, this guitar, wow,this guy is good, his lyrics are amazing, he's like Dylan but somehow different. How come i never heard this guy? And he says he's really big here,in South Africa and I was like he's great what's his name? And he says his name is Rodriguez. And I thought somebody should write some article about this guy, can't believe how good he is. And of course, ten years later, Waiting for Sugarman comes out and I think dammed, I missed my chance, If I done it then I would have rediscovered Rodriguez. But it's nice that I heard him before he got rediscovered. It was funny to discover his music in Zimbabwe but that's the part of his amazing story. He was so famous in South Africa and nobody knew him back home. I remember the name of the album, he played me Cold fact.I remember this feeling of hearing him for the first time and I wish I made the documentary before this other guy. Anyway,too late now.Nothing beats seeing people in their zone , in their moment doing what they love, that's why I think live music is so important. I think nothing really beats live music done by the people who originally wrote it that only they can really interpret it in their way. Obviously,there are great covers by great artists too. Anyway,that's my experience of different cultures. When I was sleeping in a desert in Namibia, I was hitchhiking and not doing very well so I slept in the desert and the only place nearby was this little petrol station. So I sat outside this petrol station waiting for a car – no cars came – there were these two Xhosa women, those people who speak with clicks and other sounds and that was music for me. It's so beautiful, an amazing language. I had no idea what they were talking about but it was so animated and for me that's also music,they way they were speaking wa beautiful. And I hate to think that one day that language will die. To never hear that again would be terribly sad. Just two women sitting on the either side of the bench and I'm there in the middle, it was great. What about places you've played as a musician? Is there any place you really enjoyed or where you'd like to play again? Yes of course but I'm not like Pink Floyd playing at Pompei. I'm not playing in these legendary places.Yeah of course I have some favourite venues and places that I'm really pleased to back to because I feel home there when I revisit. But as with any concert or any place, it's normally the audience who make the venue or make the atmosphere, make the concert, this is what brings the energy. Fortunately some venues are so great they bring the audience and the audience are acclimatised to this venue so it's like a ready built atmosphere. For example, the truba in Štramberk is a great place to play , I used to play there quite a lot. There are such nice people there. I used to love going back there and playing there, you have to climb up the hill and then you get there and you feel like oh great, I'm back home. Tiny place but the people who come are really decent people. Just one of many places I really love to visit. You come from London and I suppose you've played there a lot before you came here. Is there a difference between Czech audience, English audience and maybe German because you play a lot in Germany? There are differences, I don't wanna be too general about it. One of the things that surprised me most about Czech audience at my first concert – I went to see Ecstasy of St.Theresa in Akropolis,it was their album launch, pretty big show, they had lots and lots of people there. What really surprised me was that everybody was talking through the entire concert. There was this whole buzz of conversation while they were playing and I thought this is very strange. Because that's the sort of music you want really to listen to when you get there and I wondered why would they pay 300 CZK to see a show and then talk the way through it? That really surprised me. I've had concerts in the Czech republic where people are stone cold quiet or where they talk all the way through. You can't choose your audiences. It also depends where you play. You're putting numbers to your CDs and it reminds me of painters because they do the same thing. That's exactly what it is. When I grew up I was really a vinyl addict, vinyl junkie we call it, buying all the records by all my favourite bands. I'd be in a record shop every week. One thing which I really love is buying these limited editions, it's the feeling like wow, there are only 1000 pieces and I've got one!! so iI wanted to recreate that excitement but there are also more practical reasons for it that I don't wanna make 5000 because it would take most of my life to sell them, I don't have room in my tiny flat and it's just too expensive. I think that music has this intention of being timeless but at the same time it's at that moment, it's like at the first time when you hear that song and you remember it at that point and that's always gonna be live in that moment. It's a bit like when you buy this album, this album is of this moment, this chapter of your life. This is gonna be the soundtrack to this part of your life. It might not mean the same to you in ten years, it will still have that nostalgic feeling and hopefully it will be timeless, hopefully it will be an album which stands a test of time. Of course, it's not always like that, you hope at least the songs last the test of time. This is how I look at my CDs anyway. The way I recorded this song on this cd is just one way I can play this song. When I play it live on stage next week it might sound different. Maybe I'll change the lyric a little bit or maybe I'll sing it differently or maybe I'll make this part longer or this part shorter. So I think this limited edition thing is also in the music. Some of the songs on the first album – I stopped playing them that way almost immediately I was already playing them differently, playing them faster or playing them with more rhytm because playing them live is very different from the record. So I won't mind when it sells out, I'l be happy about it because by then I'd have another two or three albums. Part of the difficulty in music business nowadays is that music is available to everybody at all times and for free. That's the difficulty for musicians these days to make a sustainable career when people are not so keen to pay for music. So I'm worried that when CDs finally die a painful death and it inevitably will there will be one major stream which will loose. The fact that people are still buying my cds is not just an active kindness – it's making my career continue. People don't seem to recognize that if they just steal their favourite band's music they're actually stopping them from making the next album. No matter how much they love them. My cds are not in the shops in Iceland for example but if somebody from there wants to listen to my music they can listen to it on Spotify. They don't have to come to the concert in Czech republic and buy the cd ,they can write to me and I can post it to them. There are positive sides to every story. I think what musicians need these days is a fair deal. That's all we need, all we're asking for. I think the Internet has made life a lot easier for lot of musicians. Back in the days where there was a great booming of vinyls and cassettes only a small percentage of bands was making that money. Nowadays any band can get exposure from the Internet and that's a great thing. They can play their music via the Internet this is a great movement, it's fantastic for music and for bands. But it comes with cost, of course. All good things come with cost. I think this needs to be reconstructed a little bit more. It's not just music, it's in every single career . I can't complain too much but what I can do is campaign for a better deal for musicians. Musicians are workmen, we're craftsmen, we have a skill which people like to listen to so why the musicians are treated like lower class citizens? I wanna play like you respect me for what I do. If you want respect you have to demand it and you have to campaign for it. But to do this it requires a change of a mindset, of the way you're looking at music. This way of thinking has to change. It's crisis time. Why so many amazing musicians have to have another job? Nobody is really sure what the future for musicians – financially at least – and what the next revenew stream is gonna be. This mode has to reflect the worth of the music. It's a education without trying to guilt people into it and saying it's stealing. People who steal don't care. The problem with digital releases also is that people can't hold it in their hands and does feel like less, feels worthless. It's like ideas. Ideas can be worth million dollars but it's weightless, only when they start making money that people pay attention. I remember the days when you bought an album and it would change your life These days you can listen to everything for free and it would maybe change your day. So to answer your question, it's great for me to give something hand written, hand made to people who are kind enough to buy it. That's why I number the CDs. Your 4th album recently came out. Tell us about it. I'm very very very happy with it. As with every album it was a labour of love but love can hurt. But this one, like any album, it's painful. It's like giving birth. You can't wait for the result but it really hurts when you're doing it. The exciting part is done, you've made the music, now you have to make it listenable and that's really hard. I try to go to the studio with an open mind. It always starts with me and the guitar. I play the song how I think it's gonna sound by the end of the album and it never sounds like it starts. Things grow in the studio. I try to keep the same structure as much as possible, I try to keep the same feeling that I got in my head but even in my head I hear orchestras so I'm thinking this could use some cello or a bit of piano right here. But right at the beginning it's just you and the guitar. It's like a first brushstroke on a painting. You might cover it up hundred times, you might paint over it,it might not even be on the original painting but it's somewhere deep under codes of paint. So the demos, the guitar and the vocals – I always redo the vocals while I've got all the instruments because then there's more texture. But they listen to this first recording and they work around you. It's like tuning an engine. You can put an engine togoether, all the parts have to move in sync. I have a general idea of how I want it to sound when I go into the studio and sometimes the finished product would be what I dreamed it might sound like. I have some amazing musicians on this new album that I'm so proud to work with. I'm so happy they wanted to work with me, I'm honoured. David Babka on pedal steel guitar for example, he's just a master, he's playing with lots of amazing and famous musicians in Czech scene and here he is playing with me and it's fantastic. Jirka Vidasov who played on the third album, on the keyboards, I just loved his work on the third album and again – he wanted to work with me again, I'm so pleased! And he loves the songs and that's really what makes the difference for me. I want the musicians who are playing on it to feel the songs and he says he feels it the same way as I do. It's an honour for me to know that somebody feels it the same way as me. Of course, everybody brings something to the record. Their souls are in the record too. I've got Kate Powers again back singing beautifully, this golden-throated songbird, she's amazing. When I went to her at the beginning I said you have to be on this album, that's why I'm making it and this is like our album and that's how I feel it. She has a tone in her voice that perfectly suits this album. There's a little bit of country in there and she's a little bit country. She's got this sound in her voice , it's perfectly suited to country songs. I needed her on this album. She's a major part of it but they're all major parts of it. Matthew Gautrion, the accordion player, is there again. Sometimes I have the misfortune to hear my own music and I listen to the other musicians. I'm so happy about that. I've got a new guy who hasn't played on any other Vojtěch He understood the songs somehow and I had a particular feeling I wanted to get to this album, that I heard in old English folk records, this wooden sound, you don't get it anywhere else. Everytime he would nailed what I wanted. I thought he just played it the way he thought it should sound and he was right. I could thank everybody, Geoff Tyson again recording it, it's 4th album with Geoff, he's got a great ear, he's so talented, such a great producer. That's the musical and the sound side of it. Thematically it's very similar to the other albums, it's still part of my life, it's still experiences I've had. Couple of the songs were written 13 years ago and I finally found the right album for them. It's very interesting to rework these songs. I made a demo of one of the songs long time ago and when I re-recorded it this time I wanted to keep that feeling. And it worked. I can find myself exactly back in that moment when I hear it. And this is what I mean about the timelessness of songs. If you're coming from a point of truth in your songwriting, it never gets old because it's always the truth. Music styles change, recording techniques change but the song remains the same, to quote Led Zeppelin. This song I'm talking about is called “ Missed a word” and it's about leaving a relationship behind and driving towards the horizon, to new futures, to new beginnings. So there's a bit of sadness there but there's also hope. And I do hope that my songs have this seed of hope in them. They are all my experiences but I survived. I survived breakups, more breakups, death, loss, love,the story never ends, that's life. But I'm still alive. But I bring some humour to it, I bring a smile on my face because I got through it and this is how music works,it can heal. Time heals all wounds. I think these songs can also help in a way.When people hear them and find themselves in them, they might exactly know what I mean but they know that I'm beyond it.I think music can heal, it's the resonance of feeling of connection which you can't get from many things. You get it from sport, playing sport together. Music brings people together – hey, there's someone out there who feels like me, there's someone who knows that pain or who knows that happiness. My music is a reflection of my life. So this album is an album of survival songs. There are songs about death – it might be the end but it doesn't beat us, it's just the natural end of every life. We can't fight it. It's coming for us all, no matter what we want, it's coming for us. There's one song called “ Roses” which is about the acceptance of death and it says “ don't try to comfort me, “ I don't need your comfort, I just need time to think how this person meant a lot to me. It's like “ don't bring roses, don't bring roses down for me. I don't need them, I'm dead, just celebrate my life. Be happy that I was ever here. That's what I'm telling in the song – you'll never make me understand, you never make me agree with you, whatever you think death means to you - if I don't agree with it you're not gonna convince me. People think death is almost tabu but it's not a bad thing, we have to accept that and because of that we learn how wonderful life is. So there are some serious issues on the CD I guess but it's ultimately a happy album that celebrates life rather than mourns the death. The name is “ Go forth”, go out there, do things. It's from the Bible, from the story of Noah. God has just completely wiped out the human race and all the animals, there has been a massive flood and everything has died except for Noah and his family and the animals on the ark. It's a pretty bad time to be on Earth unless you're Noah and what does God say when they find land? He says GO FORTH, go out there, build a new world. It's our responsibility to keep positive and that's what the CD is Iabout. We have to move forth, we have to make things better. For ourselves and for others. I want the title to mean something for everybody. I don't mind if people find different meaning in my songs, it's their perception of my songs and there's no right answer. You'll also appear in a movie which is supposed to be out next year. Tell us about that. I hope it's gonna be out next year. I had a friend who heard one of my songs and wanted to record a video for me and we did “ Bed of happiness” . He played one of my songs to the director of this movie and he asked me if I wanted to be in his movie, we got together and initially I just played a musician in a back of one scene and I thought that would be it. In the end I was in 6 or 7 scenes and we'll see what's left in the film at the end. The film is about a guy who falls in love with a hairdresser (played by Vica Kerekes) . The main character is a musician and he writes songs about her a tries to win her love with music. A lot of in that are discussions about love and what love means to different people. I'm excited to see the film and I think it's gonna be interesting. Lot of the dialoques are improvised, it's in English, Italian, Czech, it's a pretty multilingual film. Editing will be a big job because there's no script as such and he's supposed to put pieces of the story together. Hopefully there will be something of me left in the movie. It's called Prahala. Speaking about love, what love means for you? Well, love is the unifying force. Let me break it down into more simple question what love means to me in my songs. Love is the lifeblood of my songs. My songs come from place of love, not from hate. I tried to be angry in a song and I find it really hard because I'm not an angry person and to manufacture anger is a worse than being angry. For me, love is the unifying force,it brings people together, not just the lovers, it unites people in a common feeling. It brings heartbreak, the other side of love, pain but what makes love so sweet, when it works,it's great. I sing a lot about love because I know I can speak with authority having been in love and it's like a direct line, it's like truth. Truth is a direct line to the heart. Love is direct line to the heart. Even if people don't accept it, even if people don't want it, you're taking Cupid's arrow and hope it hits the right target. Love and truth go hand in hand I think. You can have bad love too but only true love exists as love. So for me truth and love go together and I'm trying to speak truth with my songs. And I hope that's why people find something in it they can believe in. I think we learn to love like we learn other things. Love is not easy, even true love you have to fight for it, you have to really work hard at it and it might be the best thing in the world, you might be very lucky to find it but unfortunately life gets in the way.But true love is worth fighting for. And I write songs about it because it's also worth fighting for. I think Tom Waits said “ always keep a diamond in your mind” and there's crystal clear perception of love and truth and beauty and this idea for me is what we're fighting for truth, beauty and art. Love can't be one-sided. True love is – you put it out there and it's universal. You can't have selfish reasons for loving.It's another lesson we learn as we get older, love is not selfish. That's from the Bible. Is there any goal in music you would like to achieve? Would you like to be famous and sell out all those big places? No. I think I'm quite a private person even though I sing about my very personal life on stage. It can be quite emotional for me. It's not easy, it was a battle I had with myself – how honest I can be in front of a group of strangers? But then I just got over it. At one point I rose above it and thought if people think I'm an idiot,than I'm. If they agree with what I say they agree with what I say. If they find anything in what I say to be true that's great for me and hopefully great for them. It's a strange dilema. Someone so private should be so open. But I think there's no price you can put on privacy so being famous has very nasty things attached to it that I don't need in my life. People often ask me why didn't you go to X factor or Česko-slovensko hledá superstar? That's not what I'm looking for. Fame is not interesting for me. Obviously I'd like to make living from music, there are different ways you can do this, working with some other artists and that's something I'd like to continue. When local artist Czech or Slovak wants to improve their art, develop ideas, get a proper native English from a songwriter, not from their friend who works in a bank who might have a perfect English but he's not sort of a poet,maybe they would have to come to me. You don't have to be famous. There are a lot of great great songwriters who write their songs on household names. You make a choice if this a route you want to follow. I've had friends who said I can introduce you to my friend at the record company. I'm not looking for that. My work itself is very open. I think music should bring people together. Fame also has benefits. You would find it much easier to book concerts, you would get much money from radio. A lot of it comes at a price. At the moment I'm very happy. I call what I do being a middle-class musician. If I'm happy to play pubs and clubs and bars for the rest of my life then I'm happy doing that. My music is very intimate and very personal and I like looking people in the eye when I'm singing because there's an immediate connection. But then I've never played in front of 100 000 people so maybe I might enjoy that too. I'm waiting for the call from Bruce Springsteen to support him on his next tour and of course I would say yes. But this is a different kind of fame.And it's not something I'm actively looking for. I don't wanna start compromising my music. I wanna do what I wanna do. There are certain things that I'm looking for in my music and one of them is connection. I think there's also a difference between exposure and fame. It doesn't mean I have to accept everything fame asks for. I think fame is a curse, it's not a gift. Fame is a candle in the wind. Even Elton John would agree with me on that Respect is something else, I'd love to be respected singer-songwriter but this doesn't necessarily mean that you're famous. Maybe 100 people know who you are but they like what you do then it's an honor for me to play for them.